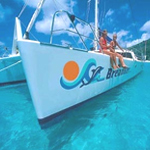 Yacht Breanker a crewed catamaran is another exclusive yacht charter offered by Barrington Hall 1-800-478-2029 The Breanker Catamaran yacht charter embarks from Tortolla BVI deep in the Caribbean. 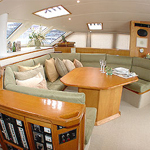 While on Breanker you will indulge in the luxury of being pampered by your crew and by Breanker’s luxurious suroundings. 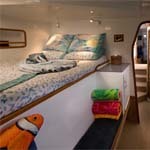 Yacht catamaran Breanker offers many options. Whether you relax on the sun-drenched trampolines, lounge in the shaded cockpit or have a fun game on the beach with cocktail in hand, your cruise aboard Breanker will be the place to spend the best week of your life. The guest cabins emphasize the importance of space, light and a good breeze. All four guest suites are designed with similar amenities - lights, fans, hanging lockers and a small settee. The salon's six overhead hatches collect the trade winds while you steal a few moments from the perpetual sunshine. From coffee in the morning to the last sip of cognac under the stars, everything is close at hand. There is lots of room on deck for toys, lots of room to relax, and all the time you are surrounded by the wondrous sights of the Caribbean. Breanker is one of three sisterships which have become known throughout the Caribbean as a first choice in private charter yachts. Your crew, Kristian & Marianne have now chartered for more than a decade. Marianne holds an International Yacht Master 3rd Degree license, and Kristian holds an International Yacht Master 1st degree license. The Taylor family. Chuck and Georgie from St. Croix, Ben and Stewart from Idaho, Jack and Kari, Rachel, Nathalie and Max from Colorado. From the first day to the last, your smiles never disappeared. What a wonderful late Christmas gift and what a wonderful New Years gift to us all! It never mattered which island, which harbor, which meal, but you always smiled and you always made us feel special. Marianne was the best first mate, executive officer and chef. Kristian was the finest captain, bartender and so, so patient with the kids. Now we have some thing very special – a family memory. And we hope that you have a memory of a family who will never forget the two of you. And we have proved without a doubt, that a family that sails together, (and drinks together), stays together. Our goal is to go catamaran sailing with you again in to the setting sun. Sorry for the late nights, tastes like chicken, chicken doodle. It has been a great trip. You have been so nice to me. Sorry for the cup. A very special trip. As I sit here on the last morning watching the sunrise and the beautiful cluster of islands, it is hard to believe I will be back in the mountains of Idaho soon. The wonderful sounds of water and wind will soon be replaced with the hustle and bustle of my restaurant, a chef coat instead of a swimsuit. I am fortunate to lead the life that I have chosen. Trips like this make it even more special. Thank you Kristian and Marianne for sharing your world. It is simply an amazing catamaran sailing vacation! It has been a wonderful experience for all of us to explore the BVI’s, but the best part was being on the Breanker with the two of you. You are the host and hostess with the mostest! Your boat is prestine and the food absolutely fabulous and you made us feel the part of the family. This has truly been a trip of a lifetime. This is difficult to put into words just how unique our time has been on yacht Breanker and with the two of you. Your patience, obvious experience and talent on deck and in the kitchen, and your infectious smiles are unparalleled. I can only say thank you for sharing part of your lives with us. People are truly blessed to have spent time with the two of you. We share that blessing. I ate too much!!! My pants don’t fit! I had such a relaxing trip, I really don’t want to go home yet. But I seriously had a great time this week. The boat is wonderful, clean and comfortable. I made some new friends in Marianne and Kristian. 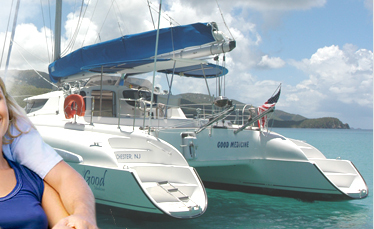 I hope I can return some day soon, to your BVI catamaran and you. I have never relaxed so much as on this Caribbean Catamaran charter trip. The friendship, the food, the drinks, the sights were well above expectations. The only thing that exceeds those insights was the camaraderie of the crew… starting as strangers and becoming great friends. Memories will remain until the next trip. Same crew and same group. Nothing could be better! Kristian and Marianne…best of luck with future charters. Thanks again. This is my third BVI catamaran charter. It is so far above the rest that words fail me (some thing all my fellow charterers and crew will tell you is near impossible). 4 guys – needing an escape – from the hustle of the real world have come together for a spectacular trip, beautiful scenery, excellent comfort, superb cooking and meals, a plethora of available activities, and a tour of great bays, great cays, and great bars. Kristian and Marianne very unobtrusively took care of our every need. Without imposing at all, they became, by invitation, friends and travel mates to each of us. Accommodations, food and drink were all top notch – but the get-away, to relax among friends, made this my best trip to the Caribbean – ever! Marianne and Kristian. We had a wonderful time on Breanker the past nine days. 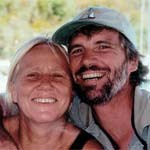 After ten years of chartering in BVI we must say that Marianne is by far the best chef we’ve ever had! Your meals were a delight and we thank you enormously for the recipes. (The royalty check is in the mail). We loved the snorkel spots and especially the “Jacuzzi”! Thank you so much for the warm hospitality and sharing your home at sea with us. Wishing you good health and many great times with your grand kids. Our very best regards, The Nobles, the Rogers, and the Morissons. Marianne and Kristian, we are having the most wonderful time on the Breanker. The cuisine is first wonderful, the company even better. We loved every moment. We hope to see you in Chile soon. Marianne – Marianne one of the greatest hands. She cooks she cleans and always dreams about her Danish land. Her favorite hobby is a gardening with all the bulbs never hardening. She is cute she is sweet, like a Danish treat and we all love her so. She is almost always in the galley, narrower than all back alleys. It is large and wide, has five heads, two hands and two large anchors. Kris and Mary they sail the seas and know all their nauticals A’s to Z’s. We wish them well with our big grin and hope to see them again. A “great en week in Danish “speaken”, we all bid our farewell! 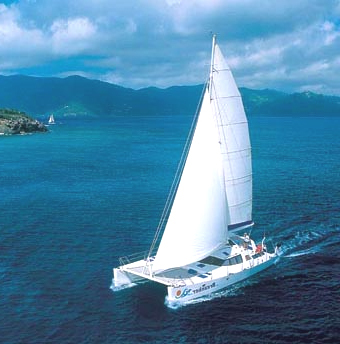 Our catamaran charter, was a wonderful starter in paradise. Ron Brown – A SUPER WEEK!